Ronni Ahmmed is one of the young avant garde artists who has made a name for himself for experimenting with the unconventional and thereby catching the viewer's attention. He has had an exhibition at Adelaide, Australia and many solos and group exhibitions at Alliance Française, Bengal Gallery, a gallery at Baridhara; he hopes to be part of a group exhibition at Goethe Institut shortly. 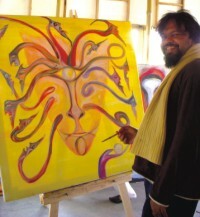 Ronni has also taken part in Britto's workshops outside Dhaka. His huge scroll-like pieces that cover myths, legends, and combines the past and future existence of man and nature , use symbols and stories, using human, animals and creatures from imagination. The colours and lines are dramatic and subtle. 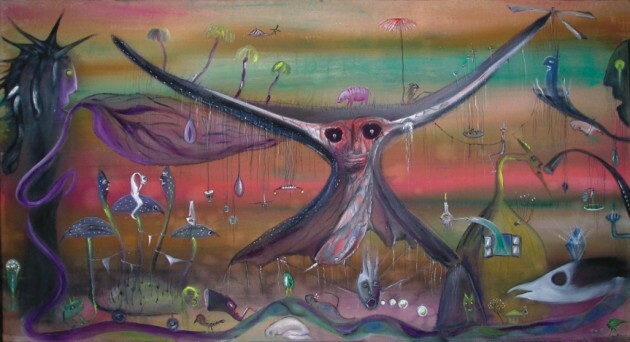 His gallery of beings have a whole collection of quixotic creatures, who reach out to outer space and the distant past. His is a subtle blend of history and “supersonic” mind blowing thinking about the present and future. The philosophers, through the years, have taught how to reach happiness and contentment. Ronni believes that the human mind is always hoping to live on. “We consciously hope to live. Happiness, tranquillity and peace are a state of the mind which we hope to reach. To reach perfect happiness, one should be able to assess the desires. Once the desires are fulfilled one can go on to the element of peace, that is sought the world over, and an artist attempts to bring this through his work.” The artist, Ronni says, should be clear about his existence. He believes that an artist cannot be a worldly being, who is thrown into the world with his talents and the materials to express his dreams. He says that there is no simple prescription for the lust for life. Each one's concept of peace and happiness is an individual one. Asked if an artist can survive presenting his own image of life and living that exists in his mind? Does he necessarily need to be honest? To this Ronni Ahmmed says the theme of life and death constantly preoccupies an artist's mind. For some artists, who are hypersensitive, says Ronni, being successful with colours and canvases means “walking on a tight rope”. It is not as easy as some nine-to-five desk job, where one gives the “boss” what he wants. After Having a Great Deal of Capitalism We are Waiting for Mr Becket, acrylic on canvas, 2004. 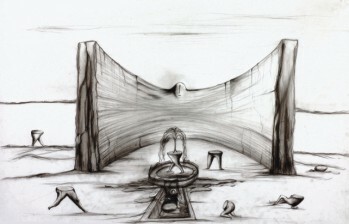 An artist, according to Ronni Ahmmed, remains bound and controlled by factors beyond himself. Artists are often misunderstood, and some are even labelled as “mad” for being different, especially by those viewers, who understand art only superficially. They tend to say, this artist is obsessed with this; or all this artist do is repeat this oft-repeated theme. Writers and composers, who are offbeat, are not so often misconstrued. Many viewers, even in the last two centuries, don't tend to take painters and sculptors seriously– and Ronni Ahmmed is one of those artists who resent this attitude strongly. It's been a long time since the great wars took place. Bangladesh has been in existence for forty years. Many galleries and art schools serve as outlets and patrons. It's high time that striving artists are given their due place in our society. We, in Bangladesh, are not always open-minded–especially to elements like surrealism–something that attacks the regular mind. Things are changing gradually, says Ronni Ahmmed. In Bangladesh “off beat” is seeing just a beginning, he says. Numerous artists are trying to set trends. Garden of Legs and its Indifferent Owner. 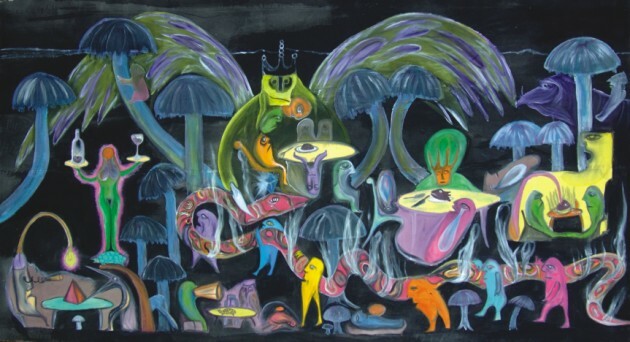 A Trip to the Futuristic Past and Stoned by an Invisible Mushroom, acrylic on canvas. “As a result Nature is being mercilessly destroyed in the name of progress and civilisation– as most artists feel. One should know the multi-layers, and hidden secrets of the myths. Dali, Picasso and important painters of the modern times have all gone for portraying myths, like the 'Guernica'. The myth of the fructification has been repeatedly dealt with by the master painters of Europe. I believe we have modern myths too like Hitler of World War II, I believe. On the other hand, Fidel Castro is the most positive character of the modern times, many feel. Similarly Pele and Che Guevara are the legends of our times. It is keeping such personalise in our mind that the Surrealistic painter of today's world moves." Talking about the subject of gallery owners dictating term to gallery artists, Ronni Ahmmed says that each gallery has its own rules and agenda. If one doesn't go along with them, one gets lest out in the race. Conditions apply to be reckoned as a painter in demand. The gallery owners too are subjected to dictates of buyers, who want a well-known painter's work to deck their living rooms. An artist, says Ronni Ahmmed, is a time traveller. His mind oscillates through time past and time present.